Cannon Rocks is a small seaside town on the Indian Ocean in the Eastern Cape Province, South Africa, between Boknes and the boundary of the Greater Addo Elephant Park. It is situated 135 km to the east of Port Elizabeth and 180 km west of East London approximately 15 minutes from the town of Kenton-on-Sea. Port Alfred is approximately 30 km to the East of Cannon Rocks. Cannon Rocks is part of the Ndlambe Local Municipality in the Sarah Baartman District of the Eastern Cape. 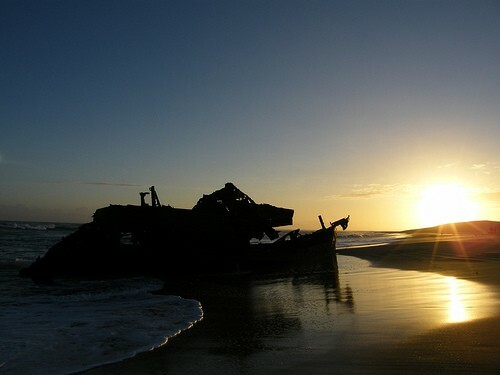 The town is named after two cannons of historical importance and is close to the Diaz cross, erected five centuries ago by Bartholomew Diaz, the first Portuguese ocean explorer to sail along the eastern coast of South Africa. The beaches are immaculately clean and safe due to the very low number of visitors and the fact that there is approximately 100 km of untouched bush and beaches to the west. Cannon Rocks provides one of the best kitesurfing locations anywhere in the world. The town plays host every year to the Cannon Rocks Kiteboarding Classic competition. And is regularly visited by some top Kiteboarders. The major attraction is the unspoilt and uncrowded nature of the beaches, coupled to a stable and predictable south westerly and easterly wind which are both cross shore. These conditions are also enjoyed by Windsurfers. The town is a premier rock and surf angling destination with the site of lone anglers making their way down the unspoilt beaches a beautiful sight. There is a charter company (Big Blue) in town that takes visitors on deep sea angling, snorkeling or scuba diving excursions. There is a two-hour drive that takes visitors through the Golden Mile dairy farms on the spectacular cliffs overlooking Bird Island and the world's biggest coastal dune field. The road turns into the state forest where century old trees form a dense canopy over the road. The road ends in Alexandria, where it branches back over the mountain to Cannon Rocks. Two hiking trails begin in Cannon Rocks. The first (7 km) starts right at the western end of town at the Cannons and winds through the bush to a look-out over the coastal dunefield. It then goes back on the beach. It is advisable to wear a sun-hat and take water. The second trail is a two-day trail that can be booked through the Addo Elephant Park offices. Cannon Rocks is a major marker for weather forecasts for the coastal belt. It divides two coastal sections: Plettenberg Bay to Cannon Rocks; and Cannon Rocks to Kei Mouth. Cannon Rocks is a small seaside town on the Indian Ocean in the Eastern Cape Province, South Africa, between Boknes and the boundary of the Greater Addo Elephant Park. It is situated 135 km to the east of Port Elizabeth and 180 km west of East London approximately 15 minutes from the town of Kenton-on-Sea. Port Alfred is approximately 30 km to the East of Cannon Rocks. Cannon Rocks is part of the Ndlambe Local Municipality in the Sarah Baartman District of the Eastern Cape. The beaches are immaculately clean and safe due to the very low number of visitors and the fact that there is approximately 100 km of untouched bush and beaches to the west. Cannon Rocks provides one of the best kitesurfing locations anywhere in the world. The town plays host every year to the Cannon Rocks Kiteboarding Classic competition and is regularly visited by some top Kiteboarders. The major attraction is the unspoilt and uncrowded nature of the beaches, coupled to a stable and predictable south westerly and easterly wind which are both cross shore. These conditions are also enjoyed by Windsurfers.